The Pokémon franchise first came to life back in 1996 and every year now February 27 is the day to celebrate its anniversary. I remember playing back then which is why I continue to play this mobile game these days. 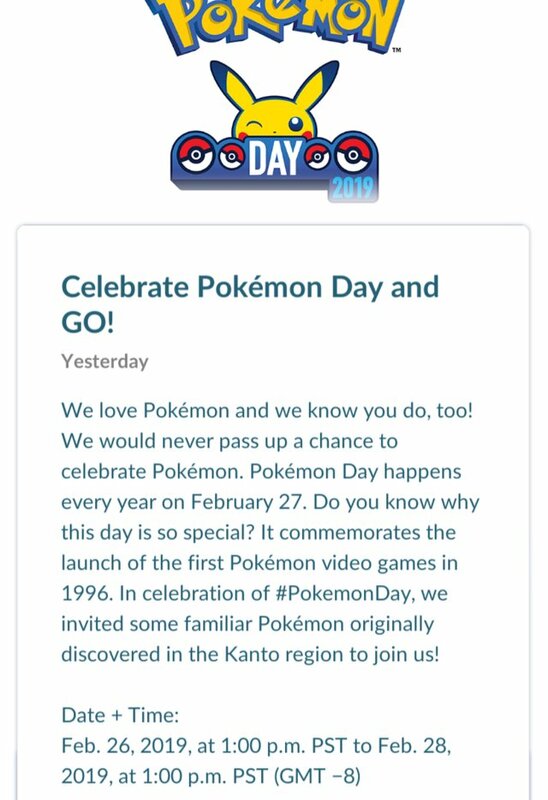 They have always done an event to celebrate so this year was not different as the company opened the mobile game Pokémon go for a special features only available for a limited time. For a limited time, spawns of generation one Pokémon from the Kanto region would spawn more often. They also added shiny forms for among the more common Pokémon like Ratata and Pidgey. In addition, new forms were introduced for Pikachu and Eevee. These new forms were much simpler than ones from the past in that instead of having hats, they would have flowers as headgear instead. Unfortunately, the event took place during the week so it was tough to get out and play in order to get these limited time Pokémon. However, I was lucky enough to encounter both Pikachu and Eevee in these limited time forms. I was not able to get any of the Shaney forms that were available during that time. at least there will now be a reason once again to catch Ratatas and Pidgeys in the future as I would not mind having a shiny form for my collection.